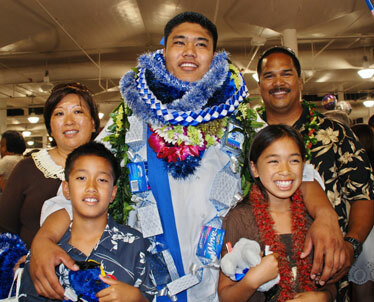 Members of the family gathered at his high school graduation. From left, Lynette, brother Kaleomana, Vaughn, sister Kelly and father Kenneth Meatoga. Dealing with the loss of a parent can weigh on a young person. But Vaughn Meatoga hasn't had to shoulder that burden alone. In the days prior to and following his mother's death last December, Meatoga found support from his extended family in the form of his teammates on the Hawaii football team -- who rallied around him even as they prepared for the Sugar Bowl -- and his girlfriend, Chelsea Ah Nee. "That was good for Vaughn because at least he didn't have to go through it by himself," said Kenny Meatoga, Vaughn's father. Meatoga, a redshirt freshman, didn't make the trip to the bowl game at New Year's, instead staying home on Kauai to be with his family. He is back on the field this spring looking to make a push for playing time at defensive tackle when the fall rolls around. He's been playing with the second unit on the Warriors' defensive front lately and his progress, on and off the field, is evident even to those who haven't known him all that long. "He's coming into his own," said UH defensive line coach Ikaika Malloe, who joined the staff in January. "He's definitely grown a lot from the first time I met him to now. In just a few months, he's come a long way." The words begin to catch in Vaughn Meatoga's throat. But he doesn't turn the conversation in another direction, though he'd be justified in doing so. "I want everybody to know her," he says, "because she fought. ... I think of my mom all the time." It's been nearly four months since Lynette Meatoga finally succumbed in her lengthy battle with breast cancer, but "it feels like a whole lot longer," the oldest of her three children says. Though the emotions remain hard to contain, Vaughn doesn't shy away from talking about his mother, instead wanting to relate the strength she showed through the ordeal. "She wasn't scared when she passed away, she was at peace," says Vaughn, a defensive tackle with the Hawaii football team. "It was a whole lot easier on me and my family. It could have been harder on us, but she was strong." His mother died Dec. 18 and Vaughn stayed home on Kauai to be with his family and attend her funeral, skipping the Warriors' trip to New Orleans for the Sugar Bowl on New Year's Day. Buoyed by support from his teammates and motivated by the memory of a mother who found joy in watching him play, the promising freshman is back on the field this spring, recently elevated to the second unit following an injury to junior Rocky Savaiiagaea. If the Kamehameha graduate continues his progress since breaking into the program as a redshirt last fall, he'll be in contention for a spot in UH's defensive line rotation when the season rolls around in August. "Vaughn is one of the most improved defensive tackles in terms of picking up the techniques and then executing them on the field," UH defensive line coach Ikaika Malloe said. "He's been impressing us day by day." Malloe lists Meatoga's quickness at the line of scrimmage and improving technique among the attributes that have him ascending the depth chart. 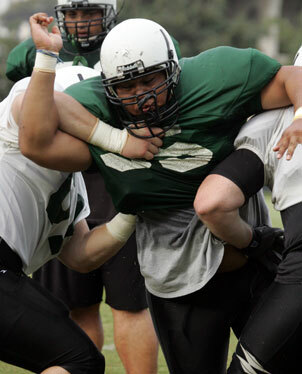 For his part, Meatoga credits a season spent adjusting to the speed of the college game for his progress this spring. "Since I've been getting more reps, everything's more natural now," he said after UH's practice last Thursday. "Last year when I'd get reps during team (periods) I'd feel like I couldn't keep up, everything felt a lot faster. This year, everything seems to slow down and I can read my keys." Vaughn Meatoga doesn't shy away from talking about his mother, Lynette, who passed away Dec. 18, wishing to relate the strength she showed while battling breast cancer. As he develops on the field, Meatoga also brings a maturity fostered during his youth after his mother was first diagnosed with cancer when he was a seventh-grader. His father, Kenneth, started working with Aloha Airlines -- which made it easier for Lynette to get to Oahu for treatments -- and Vaughn was often responsible for the household at night, looking after his younger siblings, Kelly (now 11) and Kaleomana (9), while also caring for his mom at their Kalaheo home. "He had to grow up fast," said Kenneth Meatoga, who works with the state harbors division on Kauai and gave up his job at Aloha prior to the airline's shutdown to spend more time with his younger children. "He's a good boy. When there's a job to do he's going to do it. He understands." "I try to set an example for my little brother and my litter sister," Vaughn said. "I see my dad working hard to support the family and it makes me work harder to do my part. Since I'm on scholarship, I've got the easy job. He has to hold down the house. I just have to go to class and get good grades and practice hard." Though weakened by the illness, Lynette looked forward to the family's weekend trips to Honolulu for his high school games as Vaughn earned second-team All-State honors as a senior. They also attended a few practices when Vaughn joined the Warriors last fall. The day before she died, Vaughn recalled his mom scolding him for thinking about not attending the Sugar Bowl following the Warriors' 12-0 regular season. "Even when she was going through the chemo and stuff, she made it a point to make it to every game," Kenneth said. "She would tell him to pretend the guy on the other side was the cancer to fire him up. "He's just waiting to let loose on somebody and I wouldn't want to be that guy." When doctors informed the family that Lynette didn't have much time left, Vaughn found support from his Warrior teammates, who came down to the hospital to spend time with her. And their backing helped Vaughn through the period after her death. "They helped a lot," Vaughn said. "I just called Keala (Watson) and they came down and prayed for her. "They've kind of been through it with me, they've been by my side and I know they have my back."